Pilsen Steel, a leading producer of castings, ingots and forgings experienced difficulties with ingots cracking in a forging operation. The company contracted with COMTES FHT to investigate and determine the root cause of the formation of longitudinal cracks in 34CrNiMo6 steel ingots. Traditional process involved cooling of the ingots after casting to between 500oC and 600oC, after which the ingots are placed in the forging furnace at temperature of 1100oC to 1200oC. 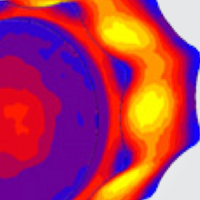 COMTES used MSC Software’s Marc nonlinear finite element analysis (FEA) software to analyze the process of heating the ingots in the furnace and confirmed that heating the ingots in the furnace generated thermal stresses that later caused cracks to form during forging. Additional simulation studies also showed that increasing the temperature of the ingots by 100oC prior to putting them into the furnace reduced thermal stresses to acceptable levels. Pilsen Steel implemented this change and it eliminated the cracking problem.